'Boring' Singapore City Photo: How do you dry your clothes? Do you hang out your clothes to dry in the sun? Dry them indoors? Use a dryer? 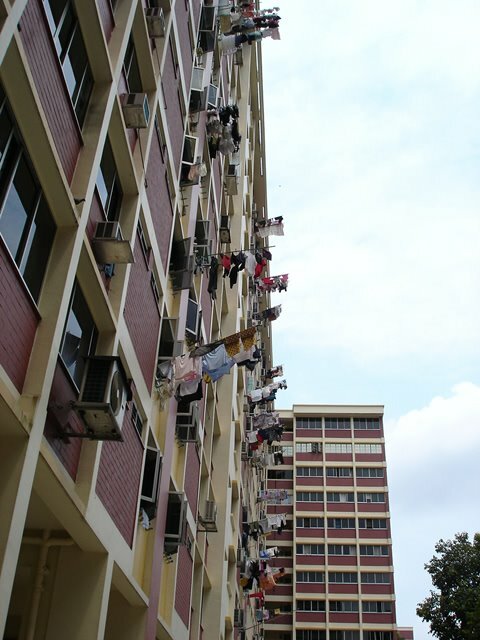 Well, in Singapore, the majority of people will hang their clothes on bamboo poles and then plug them into slots outside their flats just like this picture. Um...my mom and me all like the sun, So you may know the answer of me. Very unique photo. I'm glad you have a dryer. When I was a child we had a clothes line. As a young adult my wife and I had a clothes line however after our first child and hanging a million diapers we borrowed the money to buy a dryer. its hanging out! wont it drop? I live in a single house and have a clothes line. I have a dryer too, which we might use 5 or 6 times a year. Even if raining (which it doesn't do very often these days!) I usually use an inside airer. Australians get very distressed about seeing clithes on balconies and most unit blocks have by-laws which prevent it. Racists get really agitated about it and use expressions I won't repeat - for some reason it exercises the mnd of local paper letter writers, particularly in areas where a lot of Chinese people live. Drives me nuts that kind of petty-mindedness! I might have to try this method since the dryer on campus costs a pound. Thank you for your welcome. Actually I never use the dryer. But most of time I hang the clothes in the balcony...If the day is soooo sunny, and I have time to stay at home, I'd like hang them out with the pole. and of course wont drop, Kris, we use a kind of clips to tight the clothes. Jing, you are always online? Two responses today! I must be careful when I visit Shanghai. haha..
sally, i used to live in Melbourne for years, the places i stayed all prohibited hanging of laundry at balconies. james, i used to pay AUD2 each time I tried my clothes at uni. Min, try again, the photo's taken at District 21. hehe.. can you guess? WOW Interesting and fun shot.